7.8″ and it wasn’t done yet! The early potatoes are doing well. Tomatoes both in the high tunnel and outside are looking really good. The onions, leeks, and garlic are vigorous. 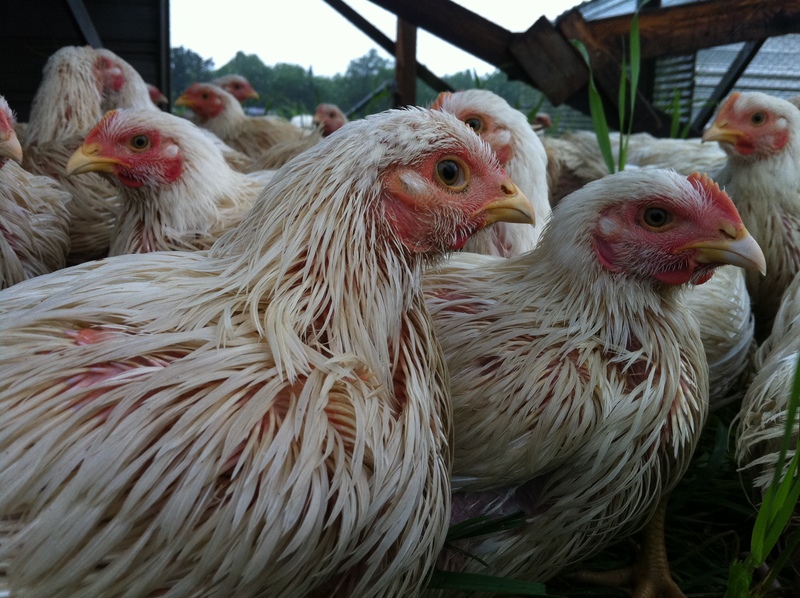 The chickens are out on pasture and doing well, happy for lots of bugs and green grass. We’re really hoping we don’t get soaked in the next few days because most things are pretty happy! 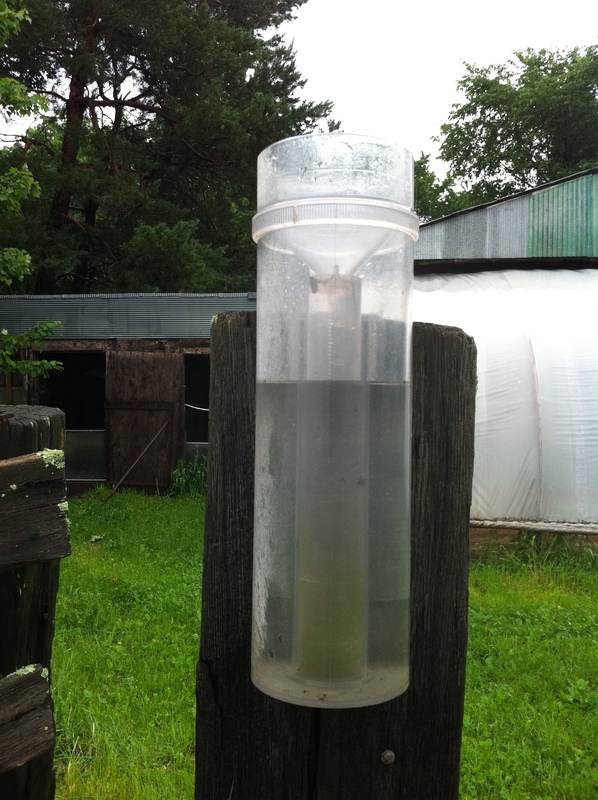 Needless to say, we did get soaked—the farm rain gauge showed 7.8” of rain overnight on Tuesday, and we got another 1.3” mid-morning deluge on Wednesday to put us over 9” for the day, and a total of 12.1” in an 11 day period. Taking a look around first thing Wednesday morning was awe-inspiring, as we saw water moving like we’ve never seen. We constructed a dam to form our irrigation pond in 2000, and since then the 10” overflow pipe has always been sufficient to handle any excess water. In fact, the pond generally fills only with snowmelt as most rain soaks into the ground before it reaches the pond. With this amount of rain on already saturated soil, water was shooting out of the pipe like a fire hose and rushing over the spillway, which has never had water in it in 12 years. None of the culverts on our farm roads could keep up with the flow and water was running over the roadways. 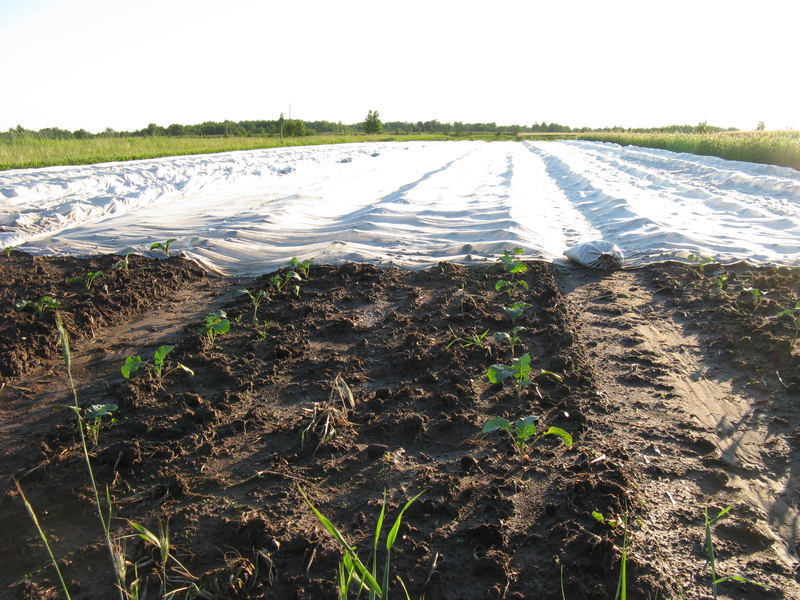 There are a number of ways that your farm weathered the storm very well: most of the veggies are grown on level ground, so we only had major soil loss from erosion in a few fields, but we did lose a moderate amount of soil from the fields with no cover crops. 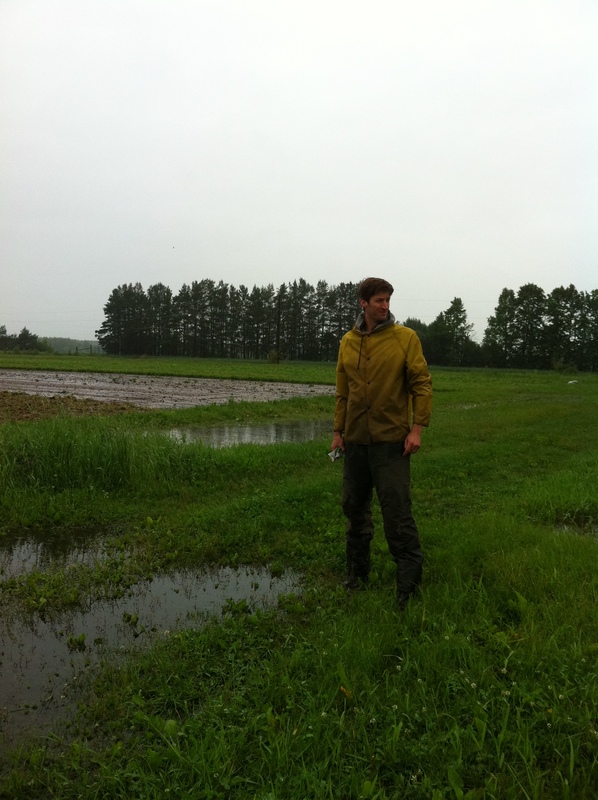 We did have portions of some crops wash out due to the sheer amount of water moving across the fields, especially small-seeded crops such as carrots and parsnips. 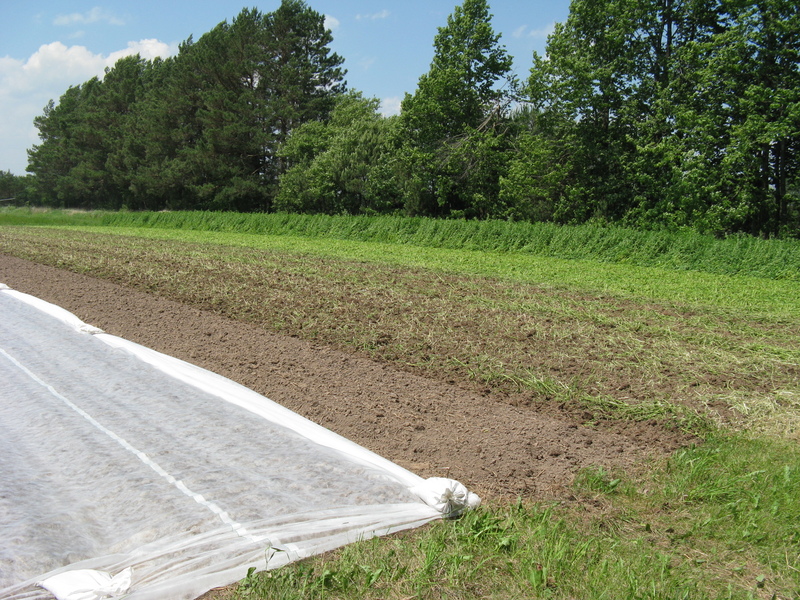 We are also very fortunate that water doesn’t run off of anyone else’s land onto the veggie fields; this limited the amount of water moving across the land (and the resulting erosion) and means we don’t have to be concerned about contaminated water coming in contact with the veggies. The bad news is that since our land is so level, it takes a long time for our soil to dry out. This means that while immediate physical damage from the water isn’t severe in most cases, we expect to have significant crop losses as plants suffer from sitting in saturated soil for a long period of time. We expect that some things will recover and others won’t, but we can’t predict how it will all turn out. For now, we’re just hoping for heat, sun and wind to dry out the fields as quickly as possible to limit the damage. We just got another half inch of rain yesterday, but the sun is shining as I write this, so hopefully this week will be good to us. As if the flood wasn’t enough, we are seeing unprecedented insect numbers this year. It started with aphids in the greenhouse this spring and in a few outdoor crops, to an infestation of a new pest that I wrote an earlier blog post about—the Variegated Cutworm—that is threatening many crops both outdoors and in the greenhouses. On Friday we just discovered potato beetles and their larvae. This is nearly a month earlier than we’ve had them in the 10 years since we began a new crop rotation system to control them. The other unfortunate byproduct of the wetness is that it delays mechanical weed control (tractors and mud don’t mix) in the crops and makes for a lot more hand weeding. We know there’s a lot of cleanup to be done all over, but if you have any extra time to volunteer in the coming weeks, please give us a call. Again, thanks for your support and we look forward to sunnier days ahead. Surveying the fields Wednesday morning. This squash plant looks fine, until you notice that the roots are sticking up in the air! A beautiful ending to a bad day. On Saturday night we discovered that one of the caterpillar pests we mentioned last week has eaten about 500 broccoli plants from our latest planting. These worms have been a problem this spring in the greenhouse, but not outside under row cover. Our neighbors have had problems in their pac choi outside, so we’ve been keeping an eye on each planting. However, the last planting we set out was split between two fields, and those 500 plants happen to be in a field we don’t walk by very much and they’re under row cover. The one field has been looking great so we were shocked to discover the infestation in the other and confused at the difference. It turns out that we used different cover crops in the two fields, and the caterpillars preferred the one that had been planted with sweetclover rather than rye and vetch. For now, we’re investigating what strategies work to control the little buggers. So the name of the pest is the Variegated Cutworm. 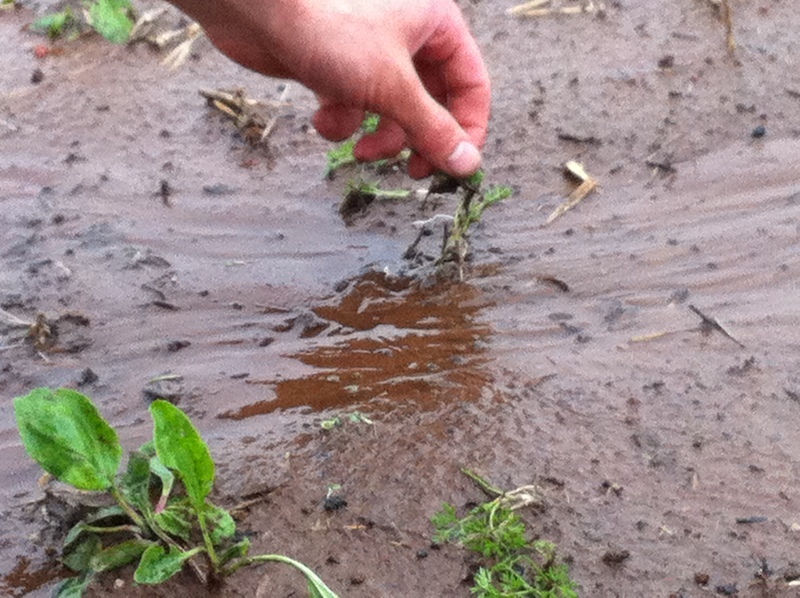 You may have read about it in the Duluth News Tribune near the end of May–while we’ve had other varieties of cutworm up here for a long time, this variety cannot typically overwinter here and hasn’t made it this far north before. We first noticed them in the greenhouse, eating spinach and carrot seedlings just as they emerged. They are generally nocturnal so we had a difficult time observing them at first, but now they have thoroughly infested three of our 6 greenhouses. We’ve never experienced a pest with as wide a range in appetites as this. Their favorites thus far seem to be spinach, broccoli, greens mix, beet greens, turnip greens, and any type of small seedling. They have also eaten off the stems of 6″ tall tomato plants, small cucumber plants, rhubarb leaves, and they are really attacking the hostas and mint that we have planted around the house. Their latest victim is green onions–they like to eat the tops off and crawl inside the hollow leaves and eat their way back out again. In my research, it also sounds like they will eat potato plants, which are mildly poisonous and tomatoes; we haven’t had any damage yet, but we should be seeing some begin to ripen in the next two weeks and that’s when we’ll really get nervous. That is an amazing variety of plants that play host to these caterpillars, and it has us worried that they will continue to be a significant problem this year, especially as plants become more stressed due to excess moisture. As far as controlling them, our hope is that on outdoor crops the birds will help with control. The broccoli that were eaten were under row cover in order to protect them from the root maggot fly, but that protected caterpillars from bird predation. 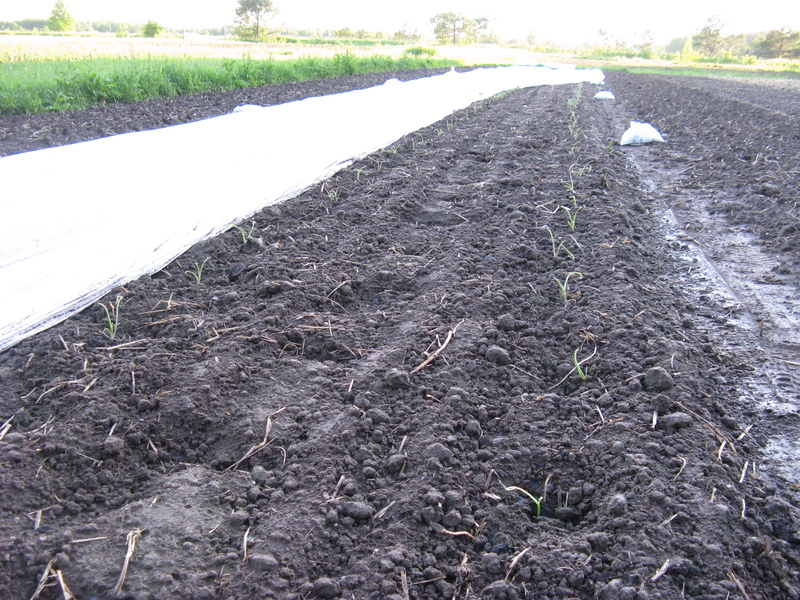 Root maggots aren’t as much of an issue after late June, so the last three plantings of broccoli won’t have to be under row cover. There are a few naturally-derived substances that are organically approved for insect control. DiPel, a variant of bT that’s targeted to caterpillars, hasn’t been very effective on cutworms when we’ve tried it in the greenhouse. Two other products are both expensive and affect a broader range of bugs, so we’re not very excited about using them. We are in the process of experimenting with Neem Oil, which is extracted from the seed of the Neem tree, an evergreen tree in India. It has been used traditionally for medicinal uses, as well as a pesticide and repellant for insects. While it doesn’t kill them outright, it appears to repel caterpillars and disrupt their reproductive cycle. None of these are very good solutions, but hopefully they will be enough to reduce the caterpillars’ destructiveness and get us through the year. I, for one, am hoping for a normal Minnesota winter so that they can’t overwinter here and are driven back to warmer climates where they have more natural enemies. Another long-term solution is tilling under cover crops a week or two earlier so the caterpillars don’t have a food source and die before the regular crop is planted. As organic farmers, the goal is not to simply replace a chemical-based pesticide with one that’s less harmful, it’s really a change in mindset. What we try to do when a new pest, disease, or weed shows up is try to understand the organism and use that knowledge to disrupt its habits and lifecycle in order to minimize the damage. 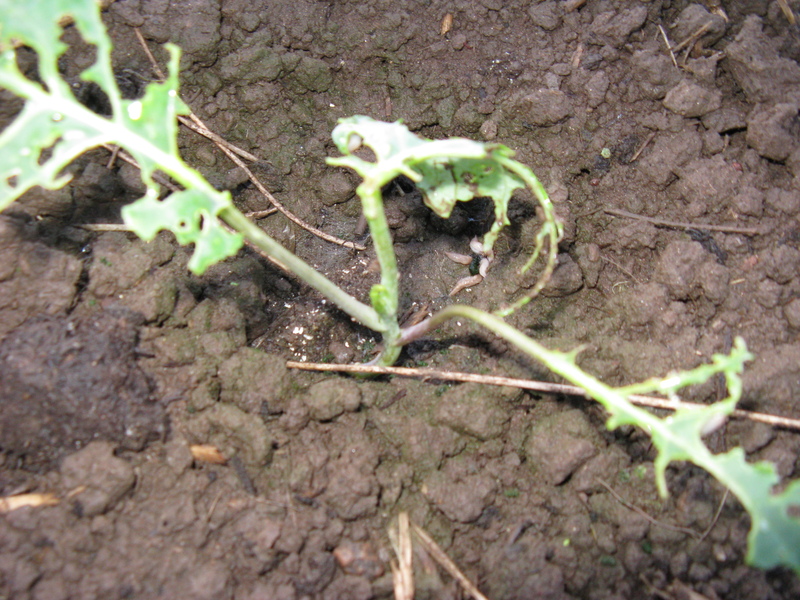 At times we still use products such as DiPel to reduce populations of Imported Cabbage Worm, for example, but when we do it’s in the context of a system that is organized around the goal of strengthening crops and beneficial organisms, and looks at the long-term health of these as the key rather than sacrificing these to the short-term goal of pest eradication. 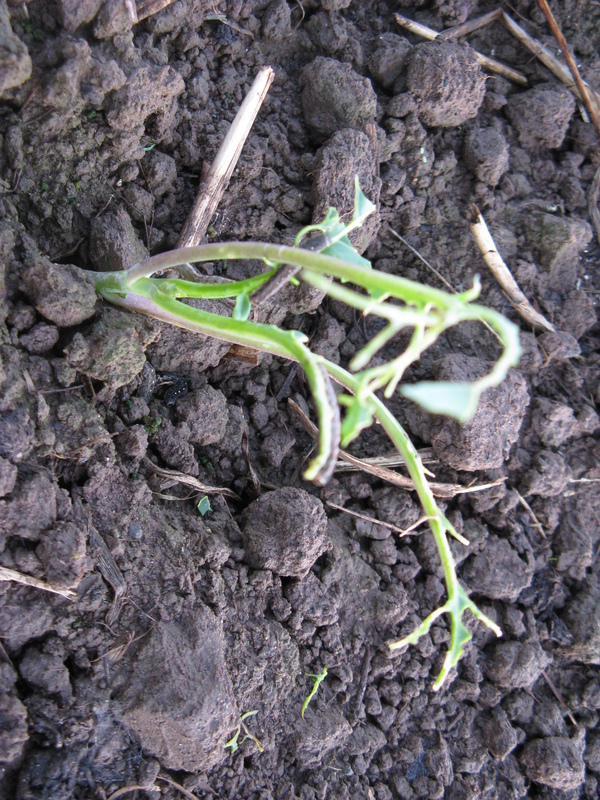 This photo was taken on June 10th, 3 days after planting the broccoli (under the rowcover). 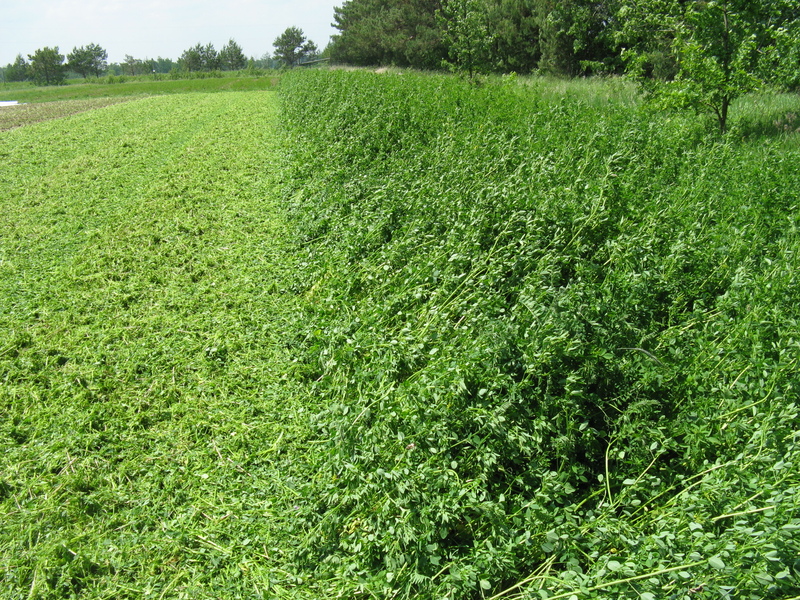 A closer view of the most beautiful sweetclover cover crop we’ve ever grown. This should have provided much of the fertility needed to grow the broccoli, breaking up the subsoil with its deep taproot, and feeding billions of beneficial soil bacteria. Unfortunately, it also appears to have attracted hundreds of cutworm moths whose larvae soon hatched and destroyed the broccoli. Those little sticks used to be vibrant transplants! If you look closely, there are 5 caterpillars on this poor little plant. The average was about 4 per plant. The caterpillars seem to have left a little bit of leaf matter on this plant, so the slugs have joined the party to finish it off! Thanks to everyone who helped make the first delivery of the season go so smoothly! In addition to the farm staff we had harvest and delivery help from Joe and Anjay Lindgren and Rollie and Tracy Bockbrader, the seven pickup site hosts had their spaces all prepared, and most of the shares found their way to the proper sites and families. We are also grateful for the patience shown by those whose shares were not at the expected site due to our mix-up! On Saturday night we discovered that one of the caterpillar pests we mentioned last week has eaten about 500 broccoli plants from our latest planting. These worms have been a problem this spring in the greenhouse, but not outside under row cover. Our neighbors have had problems in their pac choi outside, so we’ve been keeping an eye on each planting. However, the last planting we set out was split between two fields, and those 500 plants happen to be in a field we don’t walk by very much and they’re under row cover. The one field has been looking great so we were shocked to discover the infestation in the other and confused at the difference. It turns out that we used different cover crops in the two fields, and the caterpillars preferred the one that had been planted with sweetclover rather than rye and vetch. For now, we’re investigating what strategies work to control the little buggers, and Janaki will be posting some photos on the blog. Heat oil in a large skillet over medium heat. Add garlic and ginger and cook 1 minute. Add pac choi and soy sauce, cook 3 – 5 minutes, until greens are just wilted and stalks are crisp-tender. Remove from heat, season with salt and pepper, and serve. In a large bowl, combine the ricotta, 1-1/2 cups mozzarella cheese, spinach, sour cream, bread crumbs, and seasonings. Combine the tomato juice, salsa and crushed tomatoes; spread 1 cup sauce in an ungreased 13 x 9 inch baking dish. Stuff uncooked manicotti with spinach mixture; arrange over sauce. Pour remaining sauce over manicotti. Cover and bake at 350 degrees for 55 minutes. Uncover, sprinkle with remaining mozzarella cheese. Bake 15 minutes longer or until noodles are tender. Place all ingredients in a bowl. Mix well and let stand 15 minutes. Drain before serving. These make a nice condiment served with salmon, salmon patties, etc. We want to welcome back all of our returning members and our new Food Farmers. We are sending 165 shares to over 250 households this season. In spite of our best efforts, there may be some errors we didn’t catch. Please let us know if you have any problems. It’s your first share pick-up day for this season, so here is a reminder of what you need to do! Sometime between 4:00pm and 7:00pm you arrive at your pick-up site to find a stack of reusable plastic boxes. Before you take your box, you check the site for messages or a paper copy of Notes from Food Farm (unless you have signed up for the email version!) On one of the boxes, you find a sticker with your name on it. That’s your box of veggies! Opening your box is the best part. 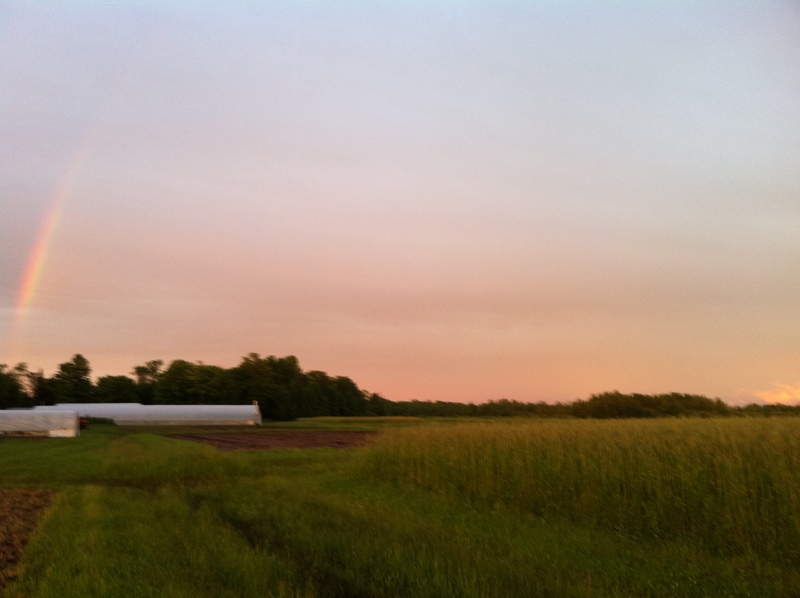 The first few deliveries will contain lots of greens (this is northern Minnesota, after all). The quantity and variety pick up rapidly as the season progresses. In fact, later in the summer the challenge is often, “How do I use all of this?” Successful use of your share requires a different approach to meal planning than the conventional way. Instead of making a menu and then getting ingredients, try waiting to see what’s in your box and then planning accordingly. There will always be at least one recipe featuring produce of that week in the Notes from the Farm. You could also Google a vegetable and search for recipes and nutritional information from the drop down menu. Also, the Food Farm Cookbook is available for $10 and is a great resource. It is very important that your share box be returned – clean – each week! Some folks have trouble remembering to return their boxes each week. You may bring bags to transport your share back home, leaving your box at the site. Please clean any veggie bits and moisture out of the box before leaving. Or, you might try emptying, rinsing and drying your box as soon as you get your share home and putting the box right into the trunk of your car so you don’t have to remember it when you leave to pick up next week’s share. A box that sits for a week or more with moisture and veggie bits is not pleasant for us to deal with! As you look at your box of veggies today try to guess what vegetable you are receiving 9 weeks earlier than last year. If you guessed CUCUMBER you are right. This spring we planted cukes in the ground in a greenhouse on April 13th. The luscious beets, baby lettuce mix and spinach are grown in the greenhouse, as well. The bad news is we probably won’t be able to send any SNAP PEAS this year. 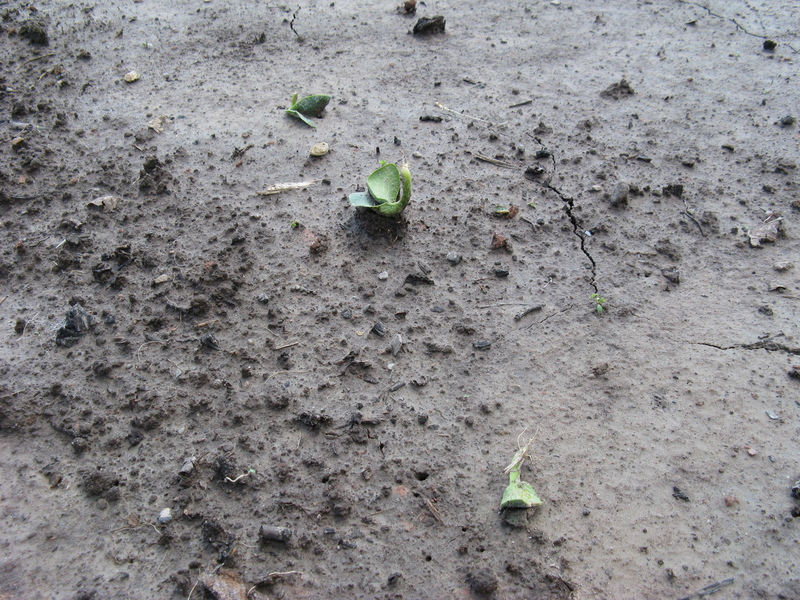 The 8 inches of rain we received between May 22 and May 30 washed out the seed of three successive plantings. More than $125 worth of seed and all our hopes for one of your favorite summer treats, down the drain. Also, the first and third plantings of the brassica family – broccoli, cabbage, cauliflower – are heavily retarded in growth due to the same drenching. The plants that have survived are stunted and will produce very small heads. Fortunately we have six successive brassica plantings, and the others are looking more promising. Another quirk we are noticing this season is a proliferation of moths in varieties we rarely see. They are producing numerous caterpillars which are munching the leaves of plants even in our greenhouses, so you will notice some holes in the spinach especially. FOR EGG SHARES ONLY! REMINDER! Eggs will be delivered to your summer share pickup site TODAY, and each week for the summer share season. The eggs will be available only during normal summer share pickup time – 4pm to 7pm. There will be a cooler at each site containing the number of dozens needed for Egg Shareholders only. PLEASE CHECK OFF YOUR NAME WHEN YOU REMOVE YOUR DOZEN FROM THE COOLER! Empty cartons may be left when you return your veggie share box each week, please stack them neatly and return only one-dozen-size, clean, serviceable, cardboard egg cartons. CELESTIAL SOUP with SPINACH Easy to make and very delicious! Whisk together the yogurt, dill, honey, & lime juice in a bowl. Add the beet and mix thoroughly. Chill & serve cold. Raitas are usually served with spicy dishes to cool the palate. Makes 1 cup.